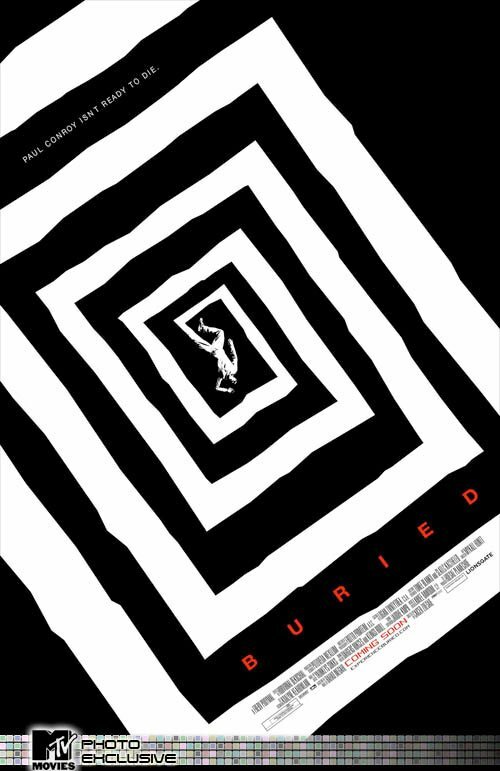 Elaborate summer blockbusters are good fun, but sometimes minimalism can really make an impact, and that’s clearly the case with Buried. The movies takes place entirely in a box buried underground, containing a cell phone, a lighter and, oh yeah, an American man who’s been kidnapped and trapped until his captors’ demands are met. See? Simple yet profound. The same goes for the film’s marketing campaign, particularly the posters. First we got the teaser, a plain old black sheet with Ryan Reynolds’ poor character confined to the bottom quarter of the page. Then there was the motion poster, which, like the teaser, keeps Reynolds locked up in a tiny section at the base of the image and enhances it with animated text and sound. And now, via MTV, we’ve got this, a poster with a hint of Vertigo. Think you’d go insane buried in a coffin with no way out? This poster certainly hints at the potential madness of the situation – and I love it.